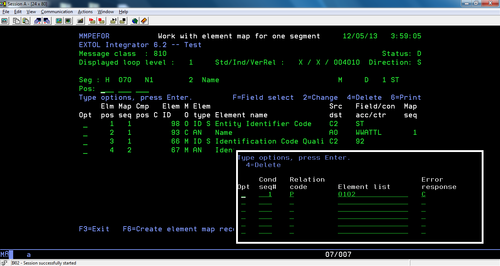 In EXTOL Integrator for iSeries, there are times when everything looks correct. However the data will not be generated correctly. In the example below we see N101 and N102 both being populated by a constant and a field, respectively. Based on the relational conditioning set-up, if field: WWMLNM is null then both the N101 and N102 elements will be null.